With few days left to the proposed resumption date of academic activities in Obafemi Awolowo University, the university management has resolved that resumption holds as earlier scheduled despite the consistent agitation by the NASU, SSANU, and NAAT union members on campus. Speaking with OAU Peeps News Agency , the University Public Relations Officer, Mr. Abiodun Olanrewaju stated that there is no change in resumption date. He further added that academic activities will commence immediately students resume. Reacting to questions from OAU Peeps News Agency, the University Dean of Students’ Affairs, Prof. I.A Aransi affirmed that the resumption date remains 2nd January and cannot be altered. " The End of the year break has been terminated,students should resume",He further added. Commonwealth Writers aims to strengthen civic voice and shape public discourse through creative expression by less heard voices. The Non-teaching staff of Nigerian Universities; NASU, SSANU and NAAT under the auspices of the Joint Action Committee JAC said they will not call off the strike unless the Federal Government answer to their demands. Speaking on behalf of the three unions, Senior Staff Association of Nigerian Universities (SSANU) spokesman, A.O Salaam said the workers are unhappy with the strike itself but were left with no other choice. Salaam said this in an interview with Journalists. In a lengthy discussion , he blamed the Federal Government for the strike. He said the Government have shown little or no concern in the matter and as it is the strike is not going to end soon. 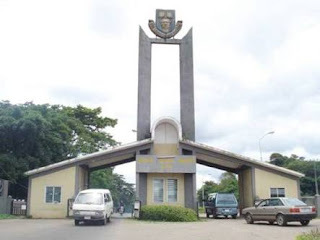 Few weeks ago, the students of the Obafemi Awolowo University proceeded on an End of the year break, the traders of the Ife City has however complained of low sales since the break amidst fuel hike. The traders in series of interview with OAU Peeps News Agency expressed their heart broken feelings over poor turn out of buyers especially during this Christmas period. In her view, Mrs Adijat Olaniyan ,an hair dresser at Lagere lamented over the poor turn out of customers saying that there is no any significant profit during the Christmas period and the normal period." People are looking for money to buy food and cloth to water for Christmas, not for hair-do as there's no sales at all" Mrs Adijat added. Furthermore, Madam Omisore Olayinka, a food seller told our correspondent that the fuel hike and hoarding by the station owner has become every Christmas period tradition which do have effect on the purchasing power of buyers. The current petrol scarcity in many parts of the country has plunged many people into confusion. This situation is further worsened by the announced temporary halt in train operations which has been a strong consolation for people who frequently travel long distances even in this time. Many are seeking ways to cushion the effect of these on their finances, health and work performances. Carpooling is an effective measure. Carpooling is an arrangement whereby several people travel together in the same car in order to save costs, reduce polluton etc. This can be of much help to especially workers who travel long distances daily. Carpooling is well practiced in many foreign countries. The advantages of carpooling are numerous ranging from economic to health, environmental advantages. 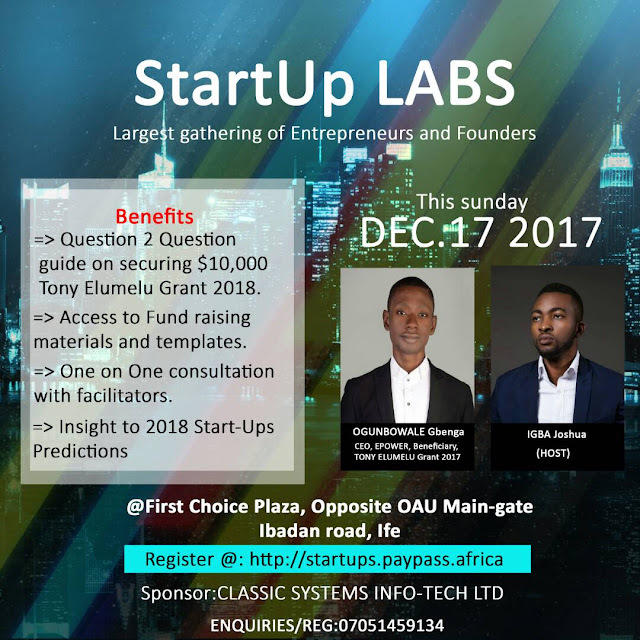 Startup LABS over the weekend hosted 21 startups across Osun state in Ile-Ife, on December 17, 2017 to learn what it takes to win the TonyElumelu grant in 2018. The meetup was facilitated by a 2017 fellow of the Tony Elumelu Foundation and founder of Epower, Mr. Ogunbowale Gbenga. With an excited guest already seated, Gbenga was able to unleash expository insights into the basics of funding and all there is to securing a long term networking relationship and opportunities with 999 fellows if a startup made the TEF list. OAU Artiste "Lardort" Drops New Jam "Kilofe"
OAU's #STEADY crooner, LARDORT, after dropping track, MY BABY with Mr. Zaki is out with another major magic titled KILOFE. This track, produced by Badman and mixed by SPIRITMYX is one that is going to keep your finger on the replay button. Click Here To Download "Kilofe"
Need to find a particular service or organization around you? Why not use the Martcol App. Martcol is a mobile app that seeks to connect business organizations and their Prospective clients together, offering a platform for convenient transactions and interactions. Business owners and other organizations are also invited to showcase their products and services to reach out to a wider audience. From the circular released by the Joint Action Committee of NASU, NAAT and SSANU based on the outcomes of the meeting carried out between the committee and the Minister of Education, the unions have been instructed to continue the strike as no reasonable agreement as been reached just yet. 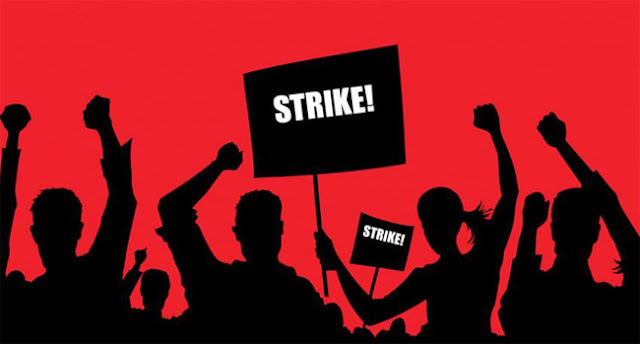 Striking non-teaching staff in universities have asked for the release of N30bn to their unions if the federal government wants the strike called off. The unions, under the auspices of the Senior Staff Association of Nigerian Universities (SSANU), the Non-Academic Staff Union of Universities (NASU) and National Association of Academic Technologists (NAAT) embarked on another industrial action due to government’s inability to honour the deal it made with them. Addressing reporters at the Federal University of Technology, Akure (FUTA) on Wednesday, SSANU national vice president, Alfred Jimoh, said if the government releases the N30 billion, it would be added to the N4.6 billion shared among the three non-teaching staff. ​The National Examinations Council (NECO) has released 2017 November/December External Senior School Certificate Examination results. Candidates are enjoined to prepare to travel back immediately after the Screening as they will not be allowed to sleep over on campus. Startups in Osun state, Nigeria converge in Ife this Sunday, December 17 to strategise on dominating Africa's Largest Business incubator,- The Tony Elumelu Foundation (TEF) ahead of 2018 cycle of applications. Registration has been on HERE (http://startups.paypass.africa). This is a meetup by StartupLABS. Question2Question Guide on TEF applicationAccess to Fund raising material and template.Insights into 2018 predictions on startups.One on One consultation with facilitators. The keynote resource for this startupLABS mmetup is OGUNBOWALE GBENGA, CEO of EPOWER. Gbenga is 2017 fellow of TonyElumeluFoundation (Africa), an international Facebook Trainer. 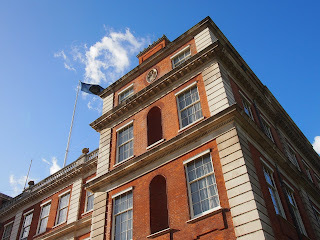 Gbenga has an Associate fellowship with the Royal Commonwealth Society (United Kingdom). He is listed among the top 50 Enterpreneurs by Diamond Bank and the Enterprise Development Center. A formal awardee of National Youth Service Corps Merit Award, amongst others. 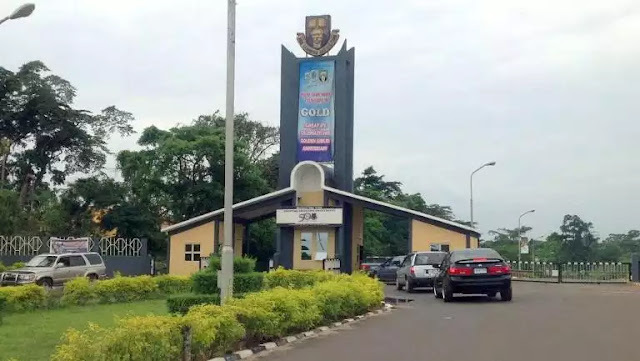 The Management of the Obafemi Awolowo University, Ile - Ife, Osun State, has paid the Earned Allowance to its workers in compliance with the Federal Government directives that the money released be paid to every segment of the University workforce. A statement by the Public Relations Officer of the University, Mr. Abiodun Olarewaju, affirmed that members of all the Unions: Academic Staff Union of University (ASUU), Non Academic Staff Union (NASU), Senior Staff Association of Nigeria University (SSANU) and National Association of Academic Technologists (NAAT) benefited from the Earned Allowance. 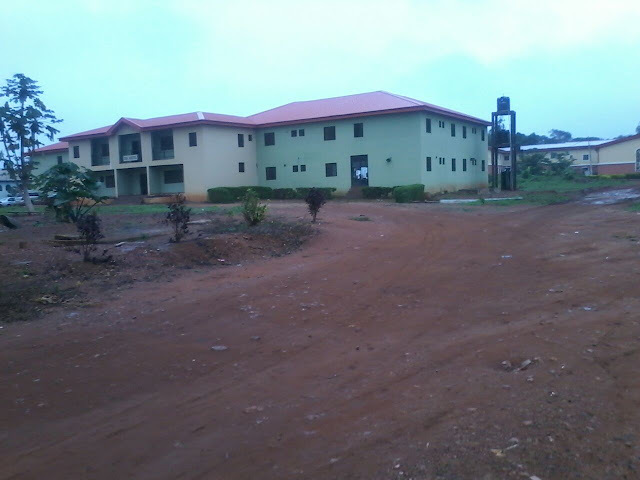 Campus journalists in Obafemi Awolowo University, under the aegis of the Association of Campus Journalists (ACJ) has called on the university authorities to immediately intervene in the worsening state of the private hostel on campus, Maintenance Hall despite the continual increase in rent cost. In a statement signed by the association's President, Okeowo Olasunkanmi; the General Secretary, Seun Ibrahim and the Public Relations Officer, Oye Ola Oladimeji, the body noted that its call is based on the "outcry of the occupants of the hall over the horrible state of the pocket-tearing hostels." As the Non-Academic Staff Union of Universities (NASU) continues its one week strike, the West African Student Union (WAFU) has asked the Federal Government to settle all outstanding agreements with both teaching and non-teaching university lecturers to enable them to return to classes as soon as possible. The students also called for adequate funding of the education sector in 2018, in order to end the incessant face-off between the Federal Government and lecturers of tertiary institutions just as it has given to other sectors of the economy. President of WAFU, Zacchaeus Maikudi speaking in Ahmadu Bello University (ABU) Zaria over the weekend lamented the negative effects of the current strike by the Non Academic staff of universities on the students. He said it is high time the Federal Government deploy adequate resources to the sector, to address its endemic problems. 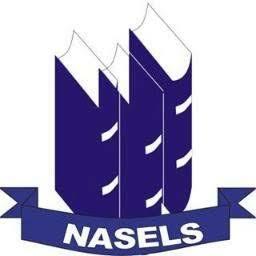 As a result of the unpalatable occurrences occasioned by the strike action of the Obafemi Awolowo University branch of the Non - Teaching Staff, which comprises Non Academic Staff Union (NASU), Senior Staff Association of Nigerian Universities (SSANU) and National Association of Academic Technologists (NAAT), the 2017/2018 sports admission screening slated for last Wednesday has been postponed indefinitely. In a release obtained by OAU Peeps News Agency from the office of the Director of Sports, Obafemi Awolowo University sports council, it stated that the exercise has to be postponed due to the unforeseen circumstances on campus. "We truly apologise for all Inconveniences caused by this postponement. It was done with the best Interest of the Applicants at mind." --Abu Adamu, Director of Sports further stated. A crucial part of business and everyday life is getting your voice heard, putting your ideas out and selling your brand. There are various forms of communication: audio, visual, audio-visual. Graphic design sits comfortably in the visual spectrum. You tell a tale with pictures and text, capturing the attention of your audience and you disseminate information through the medium. 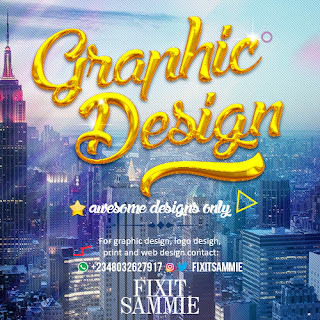 Whether you are an entrepreneur needing a logo for your brand, a musician who just recorded a monster hit requiring a masterful touch to your album art or you want to create a brochure or book cover you need the services of a pro designer. In the multitude of ads and designs out there fighting for the attention of your target demographic you want to stand out. 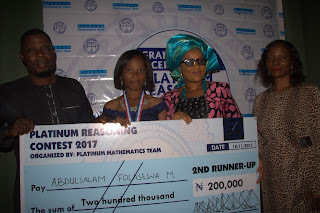 On Saturday, 18th November 2017 at Transcorp Hilton, Abuja, 16-year-old Abdulsalam Folashewa, a student of Obafemi Awolowo University, was announced as the second runner up out of about 380 registered candidates in the just concluded National Platinum Reasoning Contest organized for all students in tertiary institutions in Nigeria organized by Platinum Mathematics Team. At the same time, a student of American University of Nigeria was awarded the 1st runner up while the overall winner was awarded to a student of Redeemer's University.. The overall winner was given a cheque of N500,000, the 1st runner up was awarded a cheque of N300,000 and a cheque of N200,000 was given to the 2nd runner up. Overall winner: Bankole Oluwafemi, Redeemer's University. 1st runner up: Salisu Ahmad, American University of Nigeria. 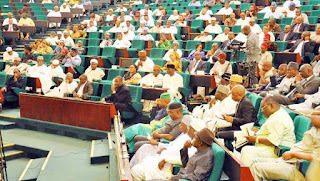 The House of Representatives on Tuesday during plenary honoured Aarinola Blessing and Abdulsalam Idowu for their rare feats and academic attainment. Ms. Blessing, 24, was admitted into the Obafemi Awolowo University, Ile-Ife, Osun State to study Medicine and Surgery in 2011. She scored an excellent Cummulative Grade Point (CGPA) of 4.74 in her first year. Subsequently in her second through sixth year she scored: Distinctions in Anatomy, Medical Biochemistry and Physiology (200L); Distinctions in Medical Biochemistry and Pharmacology (300L); Distinctions in Pathology and Pharmacology (400L); Distinctions in Obstetrics and Gynaecology, Mental Health and Dermatology (500L) and Distinctions in Surgery (600L) (An Achievement elusive for a period of 28 years in OAU/Nigerian Medicine and Community Health). Due to unforseen development occasioned by the ongoing national strike action of the non-teaching staff unions of universities, it has become imperative for the authorities of the Obafemi Awolowo University, Ile - Ife, to postpone the 43rd Convocation Ceremonies of the University earlier scheduled for December 13 to 16, 2017. A release by the Public Relations Officer of the University, Mr. Abiodun Olarewaju, stated that the non definite date for the suspension of the strike action has made the suspension of the 43rd Convocation Ceremonies of the University an unavoidable alternative. It is no longer news that the Non-Academic Staff Union of Universities embarked on what was supposed to be a nationwide strike. Unsurprisingly, the protest and strike action has been most intense at the University of Ibadan and the Obafemi Awolowo University, Ile-ife. The reason for the action was said to be the sharing formula of the Earned allowances areas as stipulated by the Federal Government. From sources online, the formula seemed grossly unfair to the union as about 89% was said to be for the Academic Staff whilst the remaining 11% was for the other three unions; NAAT, NASU and SSANU. As unfair as the sharing formula might sound, I doubt that I am in any position to comment on the correctness of the formula as I do not have all the details surrounding the sharing. However, one thing that concerns me is how the actions and the seeming brawl between the academic and non-academic staff of the Obafemi Awolowo University affect me, for obvious reasons of course. The Non-Academic Staff Union of the Obafemi Awolowo University, ile-ife today 4th December held her congress in compliance with the directives of the National Joint Action Committee currently handling the earned allowances crises going on between the union, her sister Union ASUU and the Federal Government. At the congress, the Union resolved to commence a full fledged industrial action tomorrow, Tuesday 5th December 2017 cutting off power and water supply and access to the University Health Centre. Keeping in mind that the University management in her last release signed by the University Registrar resolved to commence payment using the sharing formula stipulated by the Federal Government and also promised to take necessary actions against the Union in case of any hindrance in the activities of the University. Yesterday,December 3rd,2017, the National Association of English and Literary Students' Representative Council of Obafemi Awolowo University in their parliamentary sitting impeached the President with other executives suspended. In a resolution obtained by OAU Peeps News Agency& signed by the speaker of NSRC, Hon. Adelowo Adegboyega , he stated the crucial reasons behind the Impeachment of the president & some other executives. The embattled President , Fatoba Olusola Peter was said to be impeached on his autocratic actions, misplacement of priorities, autonomous spending without ratification from the NSRC and failure to be present in meetings summoned by the committees of the association; (including the Budget and Finance committee).